As it was a sunny day, we were able to put the pony outside. Not out to grass, of course, but for a jolly good clean. 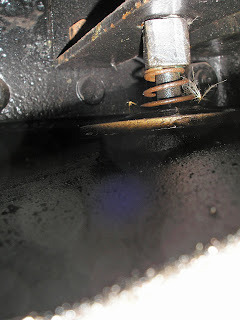 Meanwhile, there was much debate about that oil delivery pipe that had been snapped off in the dim & distant. From the drawings that Bruce had found, what we had fitted was not correct anyway. There appears to be a large disc that is pushed down onto the top cladding by the helical spring. The drawing then says to insert rubber packing below that! 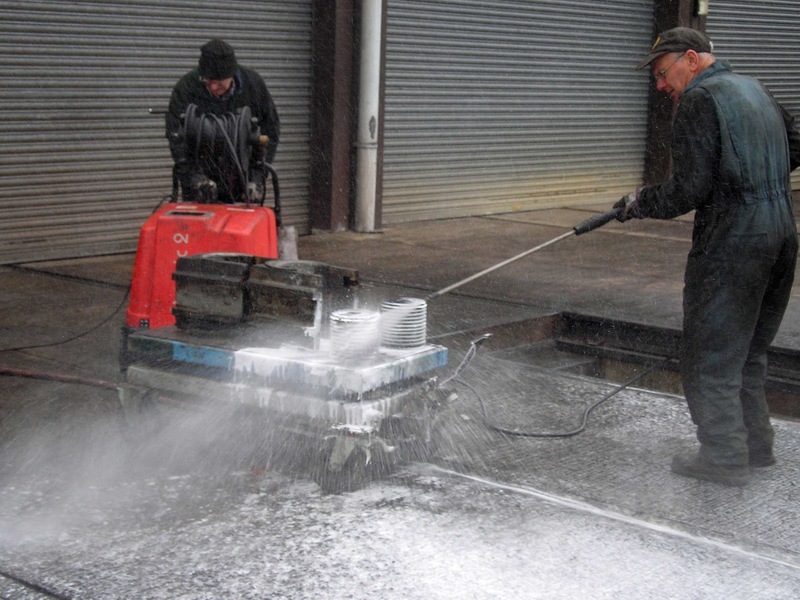 So we had a butcher's at the cladding piece, and, sure enough, there are signs of there being a large circular cover having sat on its top in the past. 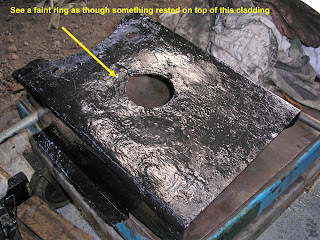 You can just make out the impression of a ring around the hole in the cladding piece. 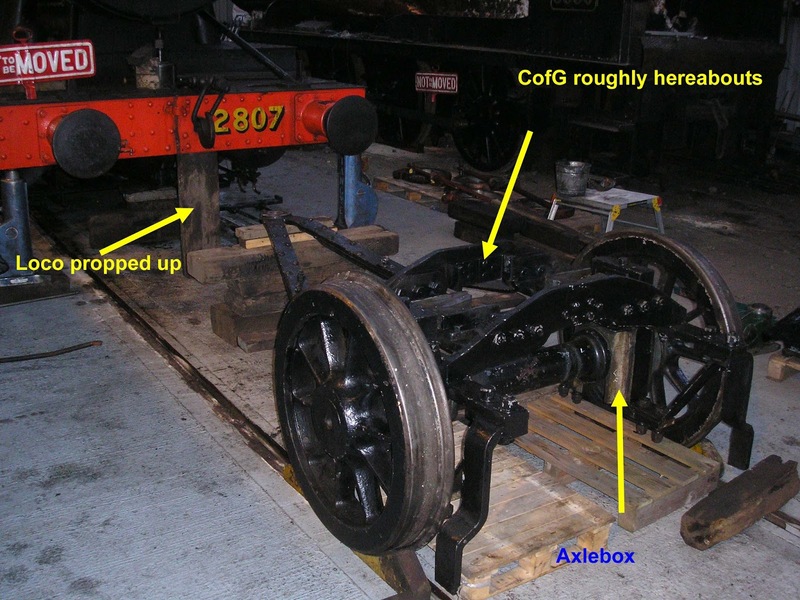 We had a look beneath the 38xx and also the 42xx to see what is there. Yup. A large disc. Actually, one felt like a rubber disc, to me, whereas the other is shiny (brass or bronze, I guess). We chewed over the options, and pored over the diagrams, and I think we've decided to make a pair of large rings out of brass (or similar). Inevitably, neither of the drawing exactly matches our pony. Ours closely resembles the diagram which shows coil springs (as "shock absorbers"), but ours has a rubber sandwich (like on the second drawing!). Just out of interest (thinking about why the pony drifts to the left) I compared the pony wheel diameters … :-) …. you might have guessed! The RHS wheel is approx 1/16" larger diameter than the LHS. 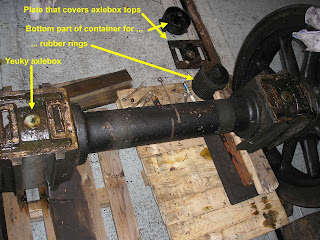 We rolled the pony back inside, and removed the tie-bars beneath the axleboxes. This is necessary in order to drop the axleboxes out … well, you can't "drop" them, as they sit on top of the axle! So, we need to lift the whole frame up off the axle, whereupon the boxes will swing round & drop off! 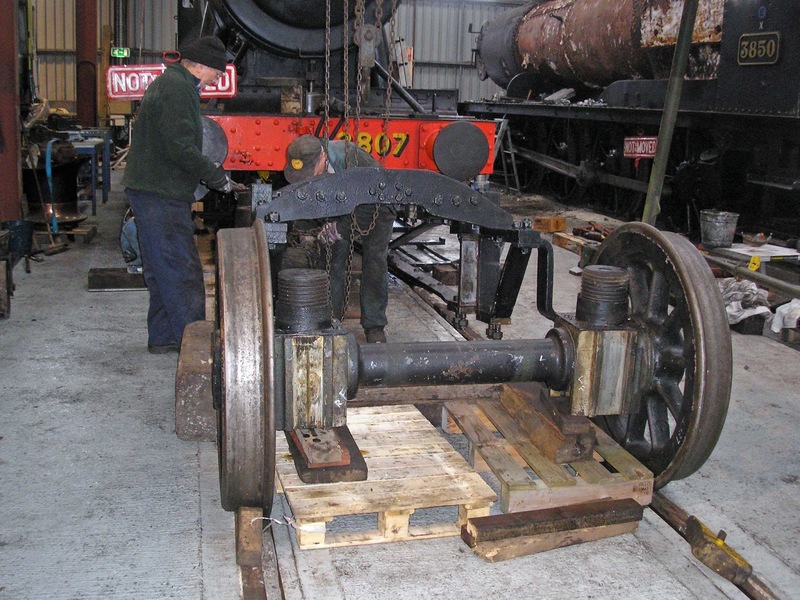 I recall well, the re-wheeling at Llangollen, and trying to keep axleboxes balanced on the top of their axles! After doing all that we could, and wanting only to have some form of lifting gear, we were forced to adjourn. There is a gantry .. in the far corner, behind Dinmore's tender, P&O, and the 55xx. 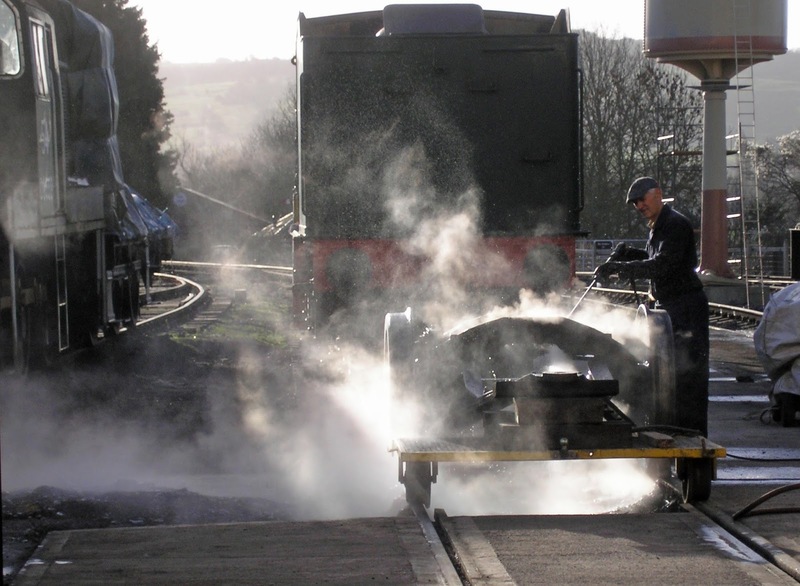 Some shunting is required to gain access, then we can wheel it round and tackle the lift. I popped down to do a couple of things. First of all, I wanted to try to cut through the bush in the end of the pony truck, which would make it easier to press out. With a new blade in the saw, this I achieved. Secondly, I thought I'd do a second test of the pony wheel diameters. I measured each wheel in two directions (at 90 degrees). They are not far off being round! There's only about 0.1 mm difference on each (which is probably within my measurement limits anyway). However, the right-hand wheel is about 1.2 mm larger in diameter than the LHS. Having split the bush, it was easy to push out just using a lump hammer. Gil was able to measure the internal diameter ready to order a new bush (i.e. with a "round" hole in the centre!). John T, John G, David & Gil worked on the wheelset. Careful lifting of the frame, pieces of wood beneath the axleboxes, and a touch of persuasion separated the frame from wheels. The axleboxes were a fairly tight fit in the guides - probably a good thing (though Gil expressed concern that somehow they might have got twisted, and hence tight! Ever the pessimist). Photo: David & John T removing the lifting chains. The white metal bearing surfaces are not bad. One side thrust face is worn, where the drift to the left had applied more pressure to that surface. The journals are in good condition, too. Once apart, we could see that there is exactly the same number of rubbers in the LHS as in the RHS - it seems that the covers over them are different on each side (hence the apparent difference in height). David and John T took the boxes outside and gave them a good clean. Gil seemed to spend the rest of the day measuring things. David had a go at removing the slide plates (the angled surfaces) which appear to be bolted down with counter-sink screws. They wouldn't budge using an ordinary screwdriver, so David tried using an impact driver. However, this was less than 100% successful, as the driver not only undid the screw, but promptly did it up again! The mechanism's functionality is suboptimal. David attempted to fix it, but gave up in the end. 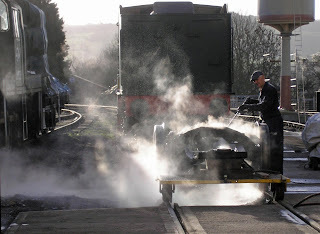 Cliff & Clive [Loco Dept] spent the morning applying a layer of bitumen paint to the tender coal space. Another coat will go on next Wednesday. JC [Loco Dept] asked if we could do a bright red rail chair for next year's Santa Specials, so that the diesel rail car driver knows where to stop. John G duly applied Signal Red to a chair. I'll drop that down to Winchcombe today (Sunday). Gil wants to measure the cylinder internals to check for wear, so John G removed the front cladding from the cylinder covers in readiness. I have been slightly concerned about the RHS rear sandbox that permanently dribbles sand (provided the box started off with some in, of course), so I decided to investigate. Removing the sandbox's bottom was a bit of a struggle - I think the protruding threads on the retaining bolts had suffered from being covered in sand. 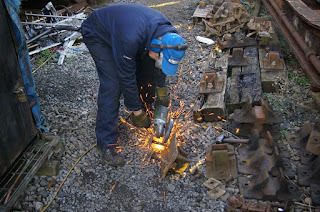 John G toddled off and dug out 8 shorter bolts (which amazed both of us … not that he went, but that he found some!). Buried in the sand I came across a spanner! 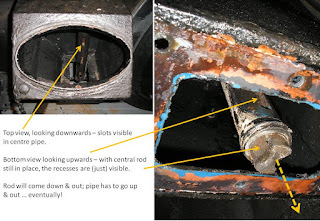 The delivery mechanism consists of an outer pipe with some slots in, and an inner rod with some lengthways recesses. Turn the rod such that the recesses line up with the slots, and sand pours out. Except that there is enough wear in the pipe that sand can squeeze between pipe and rod, and escape anyway! Getting the rod part out was not too difficult, but the pipe part only comes out of the top of the box … and hits the running board before you can get it out. This means that the whole sandbox has to come off. But, one of the side bolts happens to also attach the battery box (batteries were used for the Automatic Warning System) .. so that has to come off, too! … at which point, everyone else had gone home … so I did, as well.